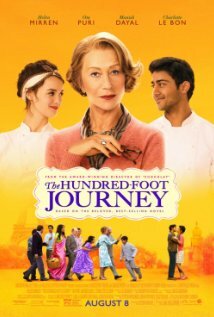 The Hundred Foot Journey follows the Kadam family’s arrival in France. After their family restaurant burns down in the lavishly and lively colored Mumbai, the family moves to a small village in France in hopes of starting anew. Unfortunately for them, while crossing the border between Switzerland and France, their car breaks down on a mountain above the aforementioned village. Papa (Om Puri) sees this as a divine message from his recently deceased wife, telling him that this town shall be where he opens his new restaurant. Led by the ever so headstrong Papa, the Kadams rent a decaying, rural building, which is a mere one hundred feet away from a highly accredited French restaurant. The restaurant, Le Saule Pleurer, is owned by the fearsome Madame Mallory (Helen Mirren), a woman -impossibly dissatisfied by her mere one star- who is hungry for a three star restaurant. 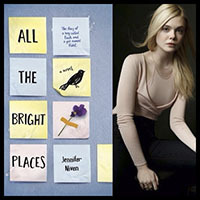 Overall, the film tends to drag on with its lengthy two-hour run time. Its conventional and safe plot offers a mindless watch for those who are willing to persevere through it; but, the rivalry between Madame Mallory and Papa adds the exotic spice and excitement that the film’s press releases extensively preached. What The Hundred Foot Journey does demonstrate is the blessing of a multi-cultural environment. Tensions grow between the traditional French and Indian cultures, but they find a harmony through the inevitable romance of Papa and Madame Mallory as well as in Papa’s eldest son, Hassan (Manish Dayal). The doe-eyed Hassan meets Le Saule Pleurer’s sous-chef, Marguerite (Charlotte Le Bon). The two meet during the car escapade in the beginning of the film, and the romance between the two is instantaneous and undeniable. Marguerite leads Hassan into the previously unexplored world of French cuisine. In time, Hassan melds the two cultures, making bastardized versions of traditional French meals, improving them to the great surprise of Madame Mallory. The two worlds find peace in both the hands and heart of Hassan. However, the true eroticism of the film is not in the romances, but in the shots of the food. Meals doused in spices with a heavy hand, eggs cracked soulfully in slow motion and then whisked to perfection with the sweet light of golden hour refracting into the lens of the camera. The shots tantalize the viewer, evoking not just hunger, but an unsatisfied delight, leaving them yearning for more. While watching the movie, the audience craves not only for the food on-screen, but to be transported to the world of director Lasse Hallström. The scenes in which Hassan and Marguerite venture out into the forest to pick mushrooms encompass breathtaking nature shots with grainy colors and focus, making one feel like they’ve stepped through the wardrobe and into Narnia. This idealistic, quaint world is enhanced through the talented hand of the cinematographer, Linus Sandgren. The Hundred Foot Journey, though long, is a movie not to miss. If one can muster the patience for two hours, its meshing of Indian and French cultures, sumptuous views, and quips between Papa and Madame Mallory make the movie a worthwhile watch.